In France, there are many ways in which the pool of violence caused by drug prohibition bleeds into home-grown jihadism. But there is an alternative. Listen to a recorded audio version of this article. Soldiers on the streets of Paris, November 2015. Thibault Camus/AP/Press Association Images. All rights reserved. For two years now, the world has been watching as France is subjected to the most vicious jihadi attacks of any European country. From the murder of the staff of Charlie Hebdo, to the massacre of partying twenty-somethings at the Bataclan, to the driving of a truck into the crowds celebrating Bastille Day, the most obvious question is – why France? Why are such a disproportionate number of their own citizens behaving this way? Last year, I travelled around France, to research an additional chapter for the French edition of my book Chasing The Scream: The First and Last Days of the War on Drugs. There are many complex reasons why France is facing more home-grown jihadism than any other western country – but on my journey, it was explained to me by many people that there is one key reason that is barely being debated. France has the most extreme and intense ‘war on drugs’ in western Europe – and there is growing evidence that there is a connecting line from that fact, to this wider crisis. One afternoon, in the late 1980s, a 12-year-old boy was playing in the street with his friends. They all lived in the notorious district of Paris known as 93; but it was peaceful that day. If you had seen these boys playing together, you might have noticed that Fabrice Olivet looked a little different. They were all white, while Fabrice’s father came from Benin, a former French colony, so he was black. To these kids, it made no difference – they all played together, as French children, in the French capital, on a summer day. Suddenly, the police approached the boys. A bike had been stolen, they said. They looked past the white kids, ignoring them, and immediately went to Fabrice. He, they believed, must have done it. Most of the non-white French citizens I spoke with had a story like this in their adolescence – a moment when they realised the officials of the French state were going to treat them differently to their white friends. And for most of them, it centred around the drug laws. As Fabrice got older, he started – like most French teenagers – to smoke cannabis. French teens have some of the highest levels of cannabis use in Europe, and I noticed that my white, middle-class friends in France seemed to think drugs were already effectively decriminalised. The police don’t bother them about it; it’s no big deal. By contrast, the French people of Arab or African descent I got to know told a different story. When Fabrice was sixteen, the police stopped him on the street – as they do routinely to non-white kids, and very rarely to white kids – and they found a small bag of cannabis in his shoe. They took him to the local police station, and there, they started to mock and insult him. They said he had drugs because he was black, and he should go back to his own country. All over the world, the ‘war on drugs’ has been waged largely against minority groups who the society already wanted – consciously or unconsciously – to keep out, or keep down. In the US, the National Survey on Household Drug Abuse found that African-Americans are no more likely to sell or use drugs than any other ethnic group – yet they make up the overwhelming majority of people punished for it. At any given time, 40% of African-American men between the ages of 15 and 35 are in prison, on probation, or have a warrant out for their arrest – and the majority are for drug-related offences. The war on drugs is targeted on people of colour. Fabrice and I sat outside a café in Saint-Denis, in Paris, drinking coffee and looking out over high-rise apartment blocks. Fabrice is a tall man, with long limbs, and an air of distant sadness. There are many ways, I learned, in which the drug war bleeds into jihadism. The first is that the ‘war on drugs’ has given the police a pretext to constantly harass non-white French citizens, on the street, and in their homes – to go after them almost constantly. France’s drug laws are the most severe in western Europe. This is one of the only democratic countries where drug use ­– as opposed to possession – is a crime, and people can be sent to prison for it. You can be sent to prison for a year for a single joint, and five years for a single plant. The result is that many of the banlieues – the ugly concrete suburbs of poverty that donut French cities – often look like they are under military occupation. I walked around the battered city of Sevran with Jean-Luc Garcia, a big, bulky former member of the French gendarmerie, who belonged for many years to a unit whose job is to keep public order. When violence broke out, he was one of the first people sent, to restore order. It’s the kind of work that people on the French right really admire, and he looks and sounds, at first glance, like a typical voter for the UMP – or maybe even the Front National. As we paced the streets, Jean-Luc began to tell me about how he realised something about France’s drug war. Since he was 17, he has smoked cannabis every now and then. He is a typical French citizen. It helps him to relax, he says, and doesn’t seem to cause him any problems. His job was physically demanding – he was often attacked – and he never under-performed. Yet as a police officer, he was being sent into places that he felt were being attacked and destroyed, just to suppress drug use just like his own. One day, he had to supervise a young prisoner who had been arrested, and get him to court. The young man had been found with 200 grams of cannabis. Jean-Luc stood in the court-room and watched as the judge refused every request for mercy. He was sent to prison. “We have a law that is very harsh,” he tells me, “but it’s not efficient.” And Jean-Luc wondered: was the boy being treated especially brutally because he was brown-skinned? Why did they only ever seem to go to non-white neighbourhoods to do drug busts? This was a core part of their formative experience as French citizens. Fabrice has seen it happen to many people. The constant police harassment makes the messages of fundamentalist groups – you’ll never be French; they’ll never accept you; a democratic society is a con; white people get to use and sell drugs with impunity, while you get condemned for it – seem more plausible. For almost all the people who have carried out murderous attacks in the past two years, this was a core part of their formative experience as French citizens. Sharif and Said Kouachi – who committed the murders at Charlie Hebdo – had been drug users and dealers. Amedy Coulibaly, who murdered Jewish people in a supermarket on the day of the Charlie Hebdo attacks, had been picked up by the police for drug offences. 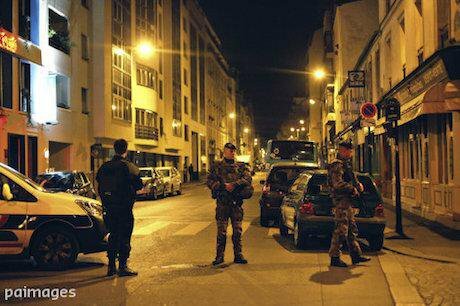 The Bataclan killers, the Nice murderer – the pattern runs across almost all of them. The unusual intensity of the French drug war – and its racist focus – has led to more disaffection and rage from its targets. Nobody is suggesting this is the only or even the main factor; but it is a significant one. It’s a key reason why Fabrice set up Auto-Support Des Usagers De Drogues (ASUD), the Association of Drug Users, to fight for a more honest debate. But this is only the first way in which this relationship between the drug war and jihadi attacks plays out. As we walked through Sevran, the former gendarmerie officer Jean-Luc Garcia explained to me: “There is no other way to describe the consequences of these anti-drugs laws, than by comparing it to US alcohol prohibition. We have the same consequences, with the same process,” he says. When you ban drugs, they don’t vanish. Instead, they are transferred from legal, licensed businesses, to armed criminal gangs. Legal businesses have recourse to the law to protect their property – so they don’t commit acts of violence. An illegal trader obviously can’t go to the police to protect their property – so they have to establish their trade, and maintain their trade, through violence. They have to fight. As the American writer Charles Bowden put it, the ‘war on drugs’ creates a ‘war for drugs’. This relates to fundamentalist violence in several ways. It means that these young men who later become jihadis grow up in an environment where carrying out acts of systematic violence is normalised. It’s part of growing up. You get your early training in violence – and the internal deadening you need in order to carry it out – by fighting rival dealers. And it means they grow up in an environment where it’s not hard to get hold of guns, through the same criminal distribution networks that bring them drugs, and not hard to learn how to use them. The German defector from Isis, Harry Sarfo, recently explained that a key concern for Isis is getting guns to their supporters in Europe. The ‘war for drugs’ makes that far easier. These are cities and banlieues awash with guns, for that very reason. To understand how normalised this violence has become, I went to see Stéphane Gatignon, the mayor of Sevran. In the year leading up to our conversation, he had to tell eight mothers that their sons have been killed in the ‘war for drugs’. He knows the number will only grow. “It’s unbearable. To have to tell a mother that her son has been shot dead. It’s awful,” he said, and looked away. When you ban drugs, they don’t vanish. There is so much chaos in the city, and drug prohibition makes it so impossible to establish control, that Stéphane Gatignon even appealed for the UN to send blue helmet peace-keepers to Sevran. When you have significant parts of your country flooded by guns, and where young people are being trained to commit violence and regard it as normal, and where the police are regarded as a despised occupying force that nobody will co-operate with, that will empower people who want to carry out violence in other causes. That’s a key reason why the pool of violence caused by drug prohibition overlaps so tightly with the pool of violence caused by jihadism. There is an alternative. It is playing out in France now. All across France, there are fields, where opium poppies grow. These poppies are used to make heroin. There is no violence associated with these poppies, or the heroin they produce. Nobody fights or dies for them. The people who use the heroin do not become sick. They do not develop abscesses, or have to have their limbs amputated. This is because these poppies – and the resulting heroin – are part of a legal trade. France is one of a handful of countries that has been granted permission by the United Nations to grow opiates legally, for the global pain relief market. (The others are Turkey, India, Australia, Spain, and Hungary). They go to make the heroin that is used in hospitals across the developed world. The problems associated with the ‘heroin trade’ follow these flowers, or the factories where they are refined, or the users who feel it run through their veins. That is because these problems are not, in fact, problems caused by the drug itself. They are caused by the prohibition of the drug. One day soon, when you are driving through the French countryside, you may see these poppy fields. Try to picture them as a vision of what France can be – if it chooses a different path. Yet only a handful of public figures are ready to see this. The US has a horrific drug war – but it also has a vibrant debate about it, and real progress, with four states now fully legalising cannabis, and more likely to follow. In France, the debate is shrouded in silence at best, and crude moralism at worst. There is – in particular – a remarkable blindness to the racism of this war. Today, there are 210,000 people arrested for drug offences in France every year, and 60% are just for using drugs a single time. In any other European country, we would know what proportion of those arrests are of non-white people. These figures would be gathered as a matter of course by the government. I suspect we would find it is the vast majority. But Olivier Maguet, who works for l’Association Française Pour La Réduction des Risques Liés à l’Usage Des Drogues (AFR), explained to me: “It’s forbidden in this country to have a database including the race of people.” It is literally illegal for the government to gather these statistics. You don’t know how much more likely non-white citizens are to be victimised by the drug war, because it is against the law to count. There is a remarkable blindness to the racism of this war. Whenever I asked others why this was the case, I would be given long and abstract lectures about how France has a concept of citizenship, derived from their revolution, that believes all citizens should be treated equally before the law. I admire that tradition, strongly. It is the right approach. But the way to uphold the idea of equal citizenship, and equality before the law, is to check whether you live up to it in practice – not to cover your eyes and ears and declare your abstract purity. To use the fact that no statistics are gathered as evidence that France’s drug war is not racist would be like banning HIV tests, and then announcing that there is no AIDS in France. Yet that is the position of the government. In fact, it goes further: the debate about the drug war is officially suppressed. In France, it is a crime to talk about illegal drug use in “a positive light.” The Body Shop was even prosecuted a few years ago for selling cream to treat dry skin, made in part from hemp, because it had a cannabis leaf on its label. In the nation of Voltaire, in the country that rallied so inspiringly to defend free speech in light of the Charlie Hebdo massacre, this has a significant chilling effect on the debate, and it may be one reason why France has the smallest legalisation movement of any European country I know. It certainly makes people afraid to promote safer ways of using drugs, like testing ecstasy tablets for any contaminants they might contain. Activists who would like to do that work told me they are too frightened to do it. And – not coincidentally – the country with the harshest drug war in western Europe also has one of the highest levels of drug use in the European Union – and the worst rate of teenagers using drugs. More than half a million French people use a prohibited drug every day; 1.2 million use regularly; and a further 3.8 million use occasionally. These figures are considerably worse than in countries where full decriminalisation has happened. For example: 39% of French 15- and 16-year-olds have smoked cannabis, compared to 19% in Portugal, where all drugs were decriminalised in 2001. This means a 15-year-old in Portugal, where it has been legal to use cannabis for her whole life, is half as likely to use cannabis as her equivalent in France, where there has been a drug war raging for her whole life. All this, then, is for nothing. How could things be different from France, if they took their success in legalising and regulating the market for opium poppies, and broadened it to include other drugs? For Chasing The Scream, I went to the countries that have adopted the most severe possible drug policies, and the countries that have adopted the most compassionate possible drug policies. In the countries that had chosen compassion and regulation – from Portugal, where all drugs have been decriminalised, to Switzerland, where heroin was legalised for addicts – I noticed a pattern in the evidence. Everywhere that has moved away from strict prohibition has seen a fall in hostility between the police, and marginalised groups. And where they have chosen a system of legal regulation, they have seen a significant decline in violence, and in criminal networks. These are, of course, long-term trends. Nobody thinks they’re a simple (or sole) answer to a very complex question. But if France moved towards regulating its drug trade, it would – over time – see several changes. The police would not have a license to harass and militarise communities where non-white people live. Those communities would become less hostile and traumatised. There would be significantly less violence in those communities: professor Jeffrey Miron has shown how the murder rate in the US plummeted dramatically when alcohol prohibition ended. With violence less normalised, this violence would spill over into other causes less. And the networks that distribute deadly weapons – which at the moment are simply a sub-set of the drug trade – would be much easier to break up. If somebody came from space, from another planet, he would think – how is this possible? Not long after cannabis was legalised in Colorado, Jean-Luc Garcia, the gendarmerie officer who turned against France’s drug war, flew there, to see what it looked like. He went into a legal store on the streets of Denver. He noticed a few things at once. There was no criminality involved with the trade any more. There were no crack-downs. There was no chaos. There were no Kalashnikovs. All the violence had been taken out of the trade. People were paying taxes on the cannabis they bought, and “this money will be used in a normal way,” he says, not to fund more crime. He noticed that on the wall of the legal cannabis store, there was a map of the world, where visitors could stick a pin to show where they were from, and where they would like to see this model of safer, regulated drug use spread. Jean-Luc took out a pin, and he pressed it into the little dot that represented Paris. If he’s right, Paris would become a place where – in time – these vicious jihadi attacks became less likely. Johann Hari’s New York Times-bestselling book Chasing The Scream: The First and Last Days of the War on Drugs is available in paperback now. This article draws on the French edition of the book, La Brimade Des Stups, published by Slatkine. Listen to a recorded audio version of this article courtesy of curio.io. This article is published as part of an editorial partnership between openDemocracy and CELS, an Argentine human rights organisation with a broad agenda that includes advocating for drug policies respectful of human rights.